Have Mercedes fixed their tyre problems? Lewis Hamilton’s win in Hungary is extremely significant. Not because Hamilton finally has a win for Mercedes, or because Mercedes won another race (their third victory of the season). 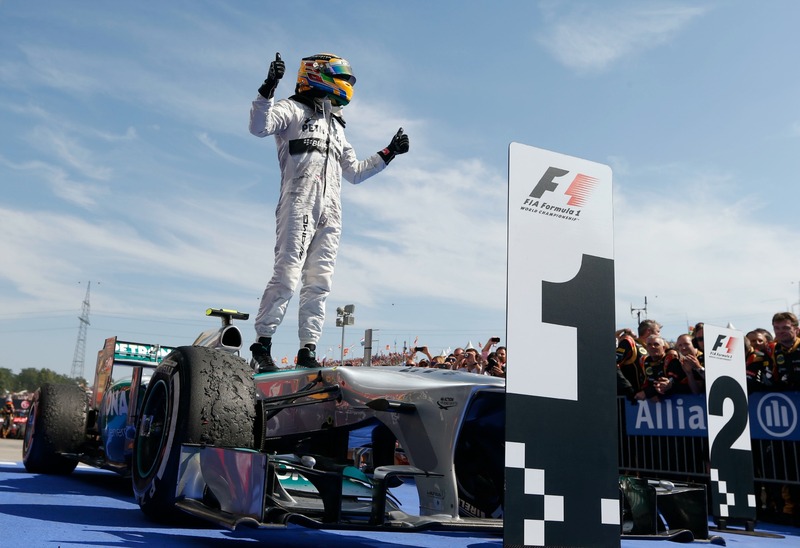 Hamilton’s win is significant because the race took place on a very hot day with a very hot track surface. Mercedes have had issues with tyre management ever since Pirelli arrived on the scene in 2011. For the last two seasons, it was Schumacher and Rosberg who found themselves diving into the pits too many times on Sunday afternoons. This season, we’ve seen Hamilton and Rosberg struggle for race pace, particularly on heavy fuel, as their rear tyres overheat and wear out. Typically, these problems have happened on warm days. The connection is logical – higher air temperatures lead to higher track temperatures, which lead to higher tyre temperatures. When a tyre overheats, it no longer provides anything close to the amount of grip it is designed to yield. On a car like the Mercedes W04 that has struggled to keep its tyre temperatures in check, hot days are therefore quite problematic. The Hungarian Grand Prix took place in unusually (for Formula One) hot conditions. Air temperature was 35 degrees Celsius and track temperature was 50 degrees at the start of the race. It was so hot that Sebastian Vettel admitted Red Bull were using the maximum available cooling on his Red Bull. During the race, Vettel was frequently told by his engineer to cool his car as he was in danger of overheating the engine. The conditions dictated that, based on their early season form, Mercedes should have struggled. But they did exactly the opposite. Lewis Hamilton won the race fairly comfortably. Yes, he was helped by Jenson Button, who held up Sebastian Vettel and Kimi Raikkonen for some time after the first round of pitstops, but it looked like Hamilton would have won the race anyway. He was fast when he needed to be and made it to the end of the race on a 3-stop strategy, just like most of the field. Nico Rosberg also made three stops, and had none of the tyre management issues seen earlier in the season. Although he did not finish the race, that was due to an engine failure, which was unusual in modern Formula One but not entirely surprising given the heat and that he spent time in traffic, where cooling is inevitably compromised. Mercedes are currently second in the Constructors’ Championship, 69 points behind Red Bull. Lewis Hamilton is fourth in the Drivers’ Championship, 48 points behind leader Sebastian Vettel. With nine races left in the season, it’s still very much possible for Mercedes to compete for both titles.